Day 41: There is absolutely nothin’ like a frame of a dame. Today’s challenge is to write a letter to the British Prime Minister c/o the Prime Minister’s Office, 10 Downing Street, London SW1A 2AA, United Kingdom. I was having a difficult time trying to decide what I should write in my application so I looked up a list of previously knighted folks. I was dismayed to find that in 2010 both Simon Cowell and Patrick Stewart will receive this award. This certainly took the pressure off. Simon Cowell? Really? Seriously? I can get behind Patrick Stewart’s nomination. Not only is he a swell actor in his own right but I obviously have a fair amount of reverence for parenting. 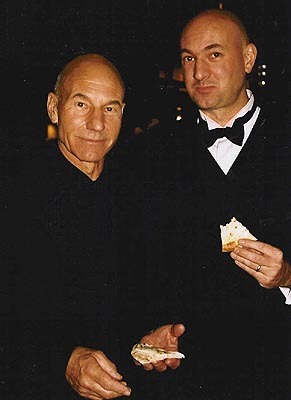 And Patrick Stewart spawned the delicious and charming Daniel Stewart. I had the pleasure of sitting through a stage combat class ages ago and found Mr Daniel Stewart’s accent and his not inconsiderable height quite charming. Once I decided that I didn’t need to try and remember the last time I had saved a family from a burning building or discovered a cure for a rare form of a cancer it was easy to decide what I ‘d write in my application. I am writing to request consideration for an appointment in The Most Noble Order of the Garter. I chose this particular order because I think it would look charming on a résumé and really might be the only reason I would have an excuse to wear an unreasonably short skirt in a public setting thereby exposing my legs, the only part of my body I have ever been pretty comfortable with. Insecurity aside, there is one thing about which I have always been extremely proud. I’d like to nominate myself because of an extraordinary characteristic I posses. We live in a competitive time. And rather than try to set myself apart I’d like to explain how it is that I can identify with people from all walks of life. An EveryLady, as it were. I am sure you are familiar with the Morton’s Toe, the term used to explain the condition where your second toe is longer than your “big toe.” My right foot is a wonderful example of this. This is referred to as the Greek foot, or the “wise toe.” My right foot is an example of my strength of character, wisdom and leadership ability. This brings me to my left foot… yep, you guessed it. My second metatarsal on my left foot lives in the shadow of my first. This pitiful little toe means I am also a proud member of the 75% of the population that has an “Egyptian Foot.” My feet are like the Switzerland of the Second Metatarsal World! I don’t take sides! Everyone can relate to me!! I hope you will consider me for an appointment. Wishing you the best in the coming year. A. I totally thought they were quesadillas, Mr Younce. B. I was thinking of “pie” as a euphemism for umm… something else. because I have the mindset of a 14 year old boy. Ask Renfroe. I assume he’ll get my drift. Firstly, pie is a perfectly dignified dessert. Secondly, if it isn’t pie then you have to entertain the possibility that the Stewarts have dressed up to eat quesadillas, and that lacks refinement altogether. Good luck on your application. We’ll have you over for tea & scones when you visit the UK to accept! Exactly, Dave. Pie in a tuxedo is acceptable, though typically accompanied by accessories such as a plate and probably some kind of utensil, preferably of the silver variety. Quesadillas in a tuxedo…it’s just not done. You should really get these things straight if you expect to be an upstanding member of the Order of the Garter. I ♥ you. I hope you get the appointment (how could you not?) and please make a video for me when they tap you with the sword or whatever it is they tap people with these days. Also, what on earth are the Stewarts eating? Is that pie? Did you really just ask me that, Paige? I’m sure that the Stewart GENTLEMEN would not be photographed eating PIE.